German brown trout are found in Cave Lake and the park’s streams. Hatchery rainbow trout are stocked in the lake, which is fed by Cave Creek and empties into Steptoe Creek. Big game animals such as elk and mule deer, and predators such as bobcat, mountain lion and coyote, reside in the area. Hawks and eagles are common, as are vulture, pinyon jay, magpie and varieties of waterfowl and songbirds. Several varieties of reptiles are present including the occasional western rattlesnake. Park vegetation is typical of the Great Basin and includes aspen, big sagebrush, rabbitbrush, Mormon tea, wild rose, chokecherry and currant. 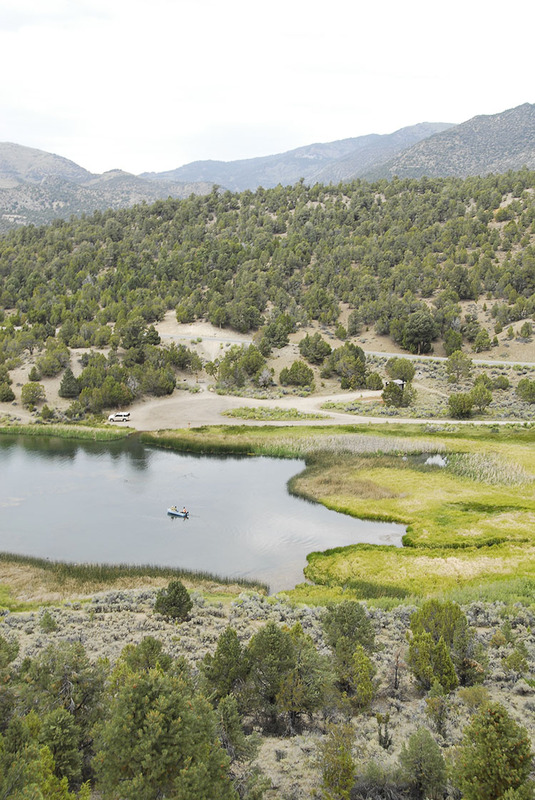 A pinyon/juniper woodland area interspersed with wetlands surrounds Cave Lake. Sedimentary limestone and shale, typical of the Great Basin, dominates park geology, and the area is characterized by large up- thrusts, narrow canyons and shallow caves. Park weather is highly seasonal with wide variations in temperature. Summertime highs may range from 90˚F to a low 40˚F. Wintertime highs are often in the 30s and 40s, and nights are often below zero. Extreme lows may reach thirty below zero. Snow is common from early December through early April, with several feet on the ground through peak winter months. The remainder of the year is relatively dry, and rain and snow showers are infrequent. Ely, Nevada, weather reports are consistent with weather at the park.